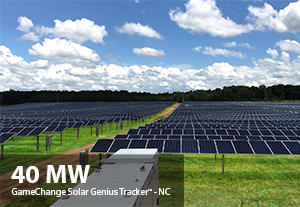 NEW YORK, NEW YORK – November 1, 2018 – GameChange Solar today announced that sales of the Genius Tracker™ single axis solar tracker system grew over 500% in 2018 to approximately 700MW. Customers are rapidly adopting the Genius Tracker™ because it has both the highest power production of any leading tracker in the United States, as well as faster install than any other system. Also, the GameChange Gen 3.0 controller, which was launched in 2017, has industry leading reliability, giving the Genius Tracker™ superior uptime numbers. This has been a contributing factor to the Genius Tracker™ having the lowest overall O&M cost of any tracker system as has been proven in a recently published whitepaper, which is available upon request.